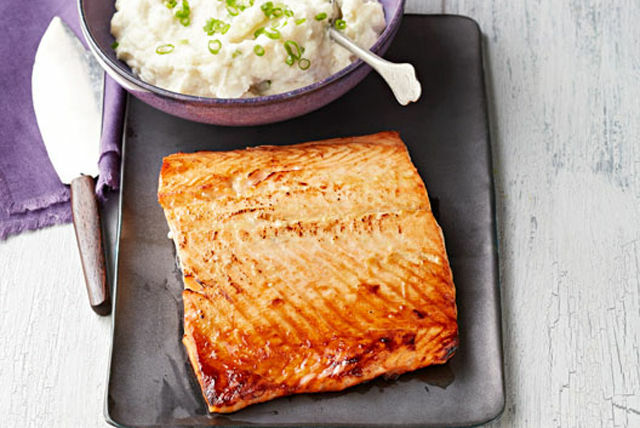 You know they'll enjoy the pan-fried salmon. But will they like cauliflower mash instead of potatoes? They will if you blend them with cream cheese! Cook cauliflower in saucepan of boiling water 8 to 10 min. or until tender. Meanwhile, brush fish with half the mustard; place, mustard side down, in nonstick skillet sprayed with cooking spray. Cook on medium-high heat 4 min. Turn fish; brush with remaining mustard. Cover; cook on medium-low heat 3 to 4 min. or until fish flakes easily with fork. Remove from heat; cover to keep warm. Drain cauliflower, reserving 1/4 cup cooking water. Place cauliflower in blender. Add reserved water and cream cheese product; blend until smooth. Spoon into bowl; stir in half the onions. Sprinkle with remaining onions. Serve with fish. Substitute 1/4 cup chopped fresh parsley or chives for the sliced green onions. Substitute a food processor for the blender.